The annual Friends of the Library of Hawaii music and book sale is a vinyl record lover’s paradise. 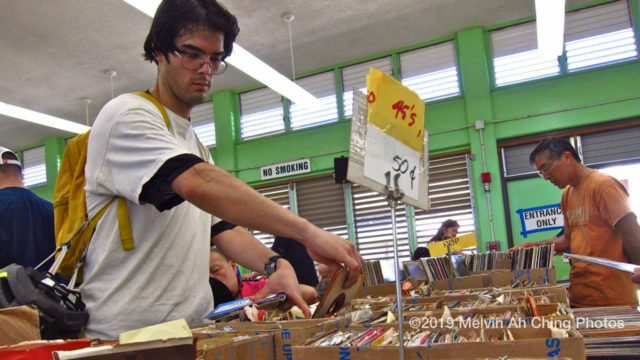 Thousands of record albums are hauled to Washington Middle School in Honolulu where music fans old and new spend hours thumbing through tons of great music from the past, scoping out new treasures for purchase. I was there. I should know. I have been a record collector for decades. I love records and music. I have plenty of vinyl records in my collection spread between two islands. A substantial amount of my vinyl is here in Honolulu with the balance from my younger days still at my former parents’ place on the Big Island of Hawaii. Recently I had to thin the ranks of my vinyl records, compact discs and cassettes. I bought a few, less than a dozen to grow my ranks. So what was one sale? Everything. 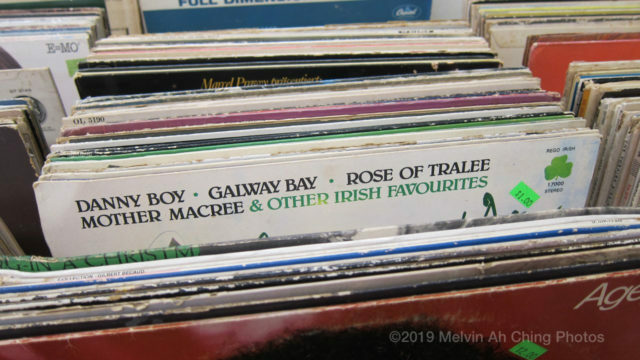 Record albums for as little as $1 each all the way up to very expensive for rare records in good condition, such as those from The Beatles, The Beach Boys, Elvis Presley and Michael Jackson. One thing for sure… music that we have enjoyed over the years, are now by artists that have “left the building”… re: dead and gone or in the case of groups, members went their separate ways. The thrill of the hunt is searching for and buying as much cheap music as you can afford. Besides records, there were also plenty of CDs, DVDs and books for sale. 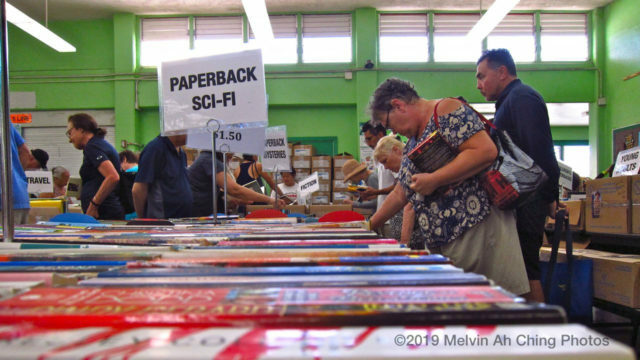 The bookworms were scrounging through the rows of titles searching for their favorites, while the music fans scoured through the boxes of records. 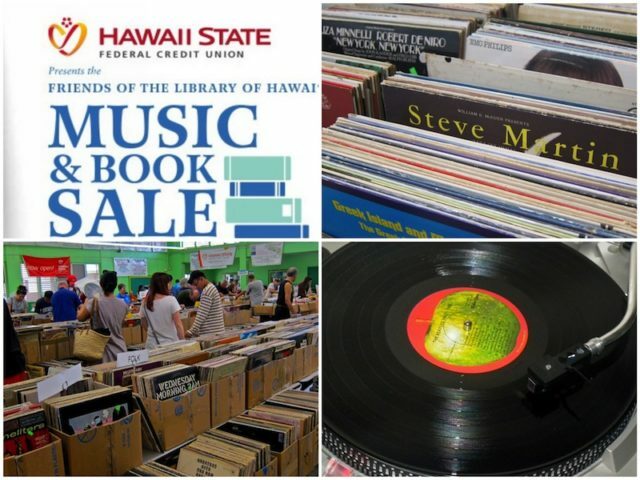 The record and book sale is one of several held each year to help fund Hawaii’s public libraries. Every purchase funds a good cause, since libraries are one of the best sources for free knowledge, information, news and entertainment. Book reading is important and so is music. The next Friends of the Library event will be held from June 22 to June 30, 2019. 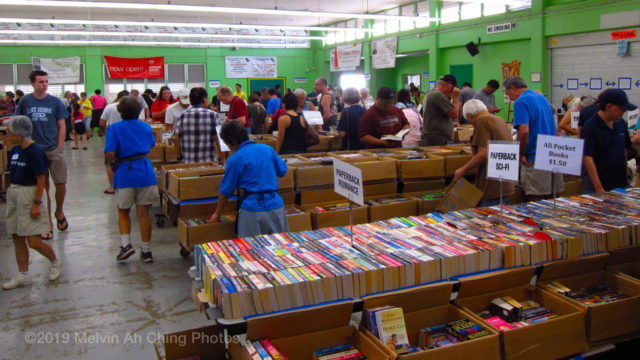 That will be the annual book sale that is held at McKinley High School in Honolulu. The sale is entering its 72nd year. The emphasis on that sale are thousands upon thousands of books. There is also music for sale there, but no vinyl, just CDs, videos and cassettes. 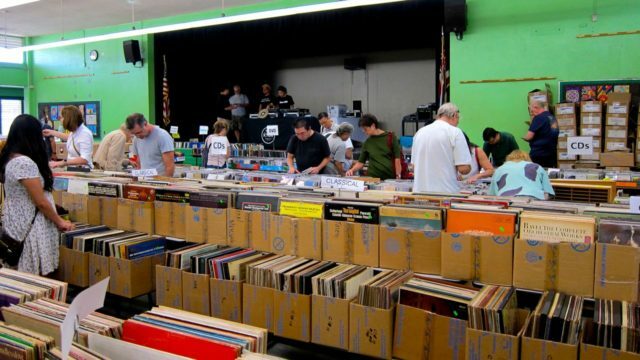 Vinyl is special and it is only available at this sale once a year. Missed it? Just wait for next January. Be sure to watch our Hawaii Files Channel video above. Plenty of books for sale. Friends of the Library records for sale.